Australia’s cities, suburbs, and regional centres are growing rapidly. More than ever houses are being made closer to streets, shopping districts and other properties. There’s more people, homes, and businesses. And while this is great for building communities and local industry, this continued growth can make finding a bit of privacy, difficult. It’s not surprising then that more homeowners are choosing to install fences for seclusion. Because doing so is one of the best ways to enhance a home’s privacy, without compromising its look or feel. For this week’s blog we’re going to take a look at the benefits of a privacy fences and what you should look for when choosing one. This is a bit of no-brainer, you are choosing a privacy fence after-all! But it’s important to note that different fences offer different levels of protection. 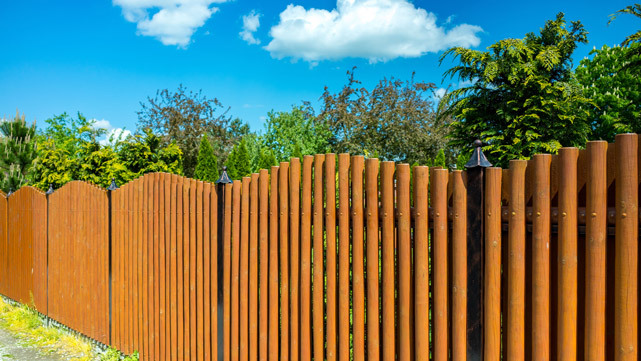 Wooden fences can be ideal for keeping noise inside and outside of your property, however they can feature gaps between fence posts and boards. Colorbond® steel alternatively keeps noise in and out, without exposing gaps. Thereby keeping out prying eyes. Fence height should also be considered. Six feet, is generally well above eye level, and should be sufficient for keeping out unwanted intrusions. We recommend seriously thinking about heights above six foot, because fences over this height can affect your home’s comfort. A privacy fence shouldn’t detract from the look or feel of your home. If anything, it should complement it, keeping your home yours, a space where you can relax away from the bustle of modern life. A privacy fence if not chosen to suit your situation and your property, can however cause a number of issues. Firstly, you don’t want to feel as if you’re living in a gaol! Secondly you don’t want your fence to clash with the rest of your home’s aesthetic qualities. Thirdly, you don’t want the fence to stop good things like sunlight and fresh air from entering your home. Speak to your fencing contractor about choosing an appropriate height, materials and positioning. These days privacy fences can be customised in a variety of ways to suit your home, needs, and style. As with all fences, you have a wide range of materials to choose from. A quality timber fence can give your home the privacy it needs, while adding the classic charm of natural wood. Redwood, juniper, and cedar are all great choices for increasing the integrity of your property, while also adding to its looks. Another option is Colorbond® steel. Unlike some timber fences, Colorbond® steel fences do not feature space between boards, therefore passerbys cannot peer through and into your property. It also comes in number of colours for added style. For those on a budget, Smartfence steel fencing, is also an affordable and durable option. If you’re building your fence between your property and another, it’s a good idea to speak with your neighbours first. In most cases there won’t be an issue, they may even be excited to see a new fence that adds significantly to the street’s appeal. In some cases though, views and access may need to be a consideration. Also when building in an established community it’s often more aesthetically appealing to choose a design that matches the area’s chic. City and council regulations may also restrict heights and styles. So it’s worth speaking to your fencing contractor about your region’s guidelines. Plants can be terrific for improving noise insulation. They can add a touch of the outdoors, even if you’re living in a bustling city. And they can assist in obscuring the view into your property. Selecting the right plants can really add to your home’s presence, and your new privacy fence can be coloured to match. A natural green steel fence is the perfect backdrop for a wall of plants or vine creepers. A classic timber fence is another great option for adding that natural touch to your home. Plants offer shade in summer, and can help to refresh the air around your home. Plus they can make unwanted access to your home more difficult, by providing an additional barrier that intruders would need to surpass. If you’ve enjoyed reading this article and would like to find others similar to it, you can do so by following the link below.